The Biomedical MEMS and Sensors Conference 2013 held April 16-18 at Lorain County Community College brought presenters, exhibitors and attendees from around the US and the world to focus on MEMS technologies for biomedical applications (BioMEMS). The presenters included CTO’s and CEO’s from industries using MEMS in Sports Applications, v enture capitalists who provide the funding for the research and development on these new applications, colleges and universities from around the world conducting research and the entrepreneurs who risk failure to bring these new products to market. Presenters included those from: DeNovo Sciences, BodyMedia, Virtus Advanced Sensors, Inc., DiPaola Consulting, STMicroelectronics, Institute for Complex Engineered Systems, Carnegie Mellon, Biomedical Engineering, Johns Hopkins Department, MEMStim LLC, Rheonix, Inc, Department of Chemistry, Lehigh University, Lorain Community College, Life Technologies, Platypus Technologies LLC, Food and Drug Administration, Royal Institute of Technology, Case Western Reserve University, IMEP-Lahc Minatec / Grenoble INP and Purdue University. The topics varied from Visual Prosthesis for the Blind to Drug Delivery Systems, HIV Detection, Food Safety Testing and Continuous Remote Health Monitoring, all adding to the quality and quantity of life, made possible by advances in MEMS Sensor Technology. In addition to the technical sessions, entrepreneurs and venture capitalists who have experienced the rigorous process of taking an idea from concept to prototype to a marketable product shared their experiences. Guidance was provided to the steps required for a successful product development, commercialization and entry into the marketplace. You may be wondering what RBB’s involvement is in the MEMS market. Most, if not all of the products discussed require products other than the MEMS device to create the final product. The device may require a desk top processing unit if it is a “LAB on a Chip” or an external unit to collect data from implanted devices. Most of the projects start as prototypes or small batch proof of concept production which is where RBB Systems is positioned to support the customer’s needs. 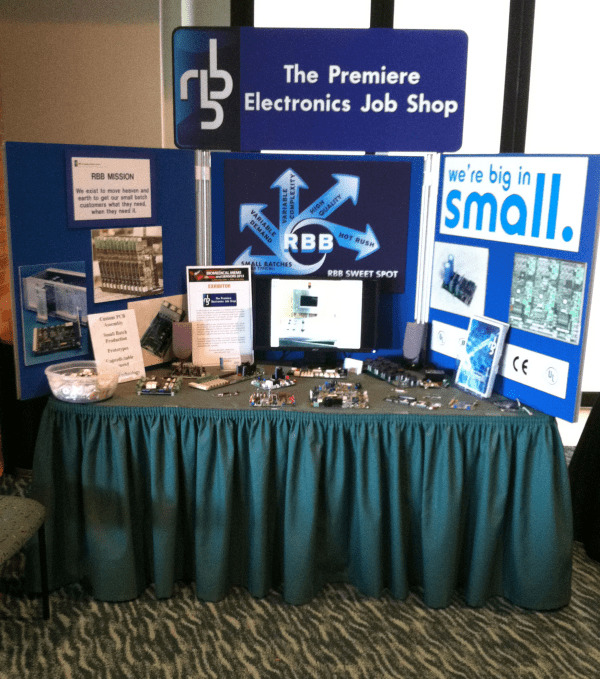 With our booth being in the same room as the presentations it gave us the opportunity to hear all of the presentations which gives us a better understanding of the MEMS technology and how RBB can assist customers with the implementation of their MEMS bases projects. The proximity to the meeting has given us the opportunity to talk with many attendees, speakers and other vendors who have stopped to visit our booth and find out about RBB and how we are positioned to assist them with their projects. Being a techie at heart I am already looking forward to next year’s BioMEMS program! Check out fellow attendee, Kurt Schaefer's recap from last week.